MS 2 - Ultra compact! 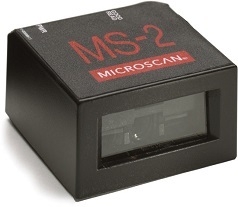 The user-friendly MS-2 is a fully packaged CCD reader, offering easy integration and several configurations to meet a variety of needs. Advanced CCD technology is coupled with world-class algorithms to ensure easy and accurate decoding of small, damaged or poorly printed codes. High performance and flexibility make the MS-2 the optimal embedded reader for reading difficult codes. Compact & Lightweight: The 1.75” (44.5 mm) square by 0.85” (21.6 mm) tall reader weighs less than 2 ounces (57 g) for easy mounting onto robotic equipment or into tight spaces. Visible Indicators: Illuminated LEDs on top of the reader provide visual confirmation of reader status. Versatility: Low and high density scan angle versions allow flexible configuration for a wide range of applications. Reading Capabilities: The MS-2 can easily read the most difficult codes, and excels at reading on highly reflective surfaces. ESP®Easy Setup Program: Single-point software provides quick and easy setup and configuration of all Microscan readers.